It’s no secret that automation is on the rise, regardless of the sector you look at; driving health and safety standards to the best they have ever been, while streamlining manufacturing processes and delivering better and more consistent product lines at the same time. For the food and drink sector, new technological developments such as intelligent vehicles, stock management and replenishment systems could just be the tip of the iceberg when it comes to how automation is used to its full potential within this market. Artificial intelligence (AI) and robotics have long been tipped as the future of manufacturing, and not just for their cost and time saving benefits. With their ability to self-regulate decision making, food manufacturing professionals can focus their attention on performing more high-level tasks that require more skill and maintenance. The use and development of autonomous vehicles has dominated the headlines in the past couple of years, with the UK Government revealing ambitious plans to have them on the nation’s roads by 2021. While the British public wait with much anticipation, the manufacturing sector look to benefit from these a lot sooner. Autonomous Intelligent Vehicles (AIVs) and Automated Guided Vehicles (AGVs) are now being rolled out in warehouses across the country. Food and product manufacturers have played with the idea of implementing AIVs, AGVs and robotics to move tools, manage stock levels, shipping and within ERP systems for quite some time with little action. And, following the widespread attention automation has received in recent months, I believe we will see many more suppliers recognise the benefits of these types of systems to improve productivity and efficiency and begin to invest. While different AVs have their own pros and cons, engineers are still working to address some of the health and safety concerns many manufacturers are concerned by. AGVs, for example, only follow pre-programmed paths (using elements such as line-following technology, magnets or barcodes) so wouldn’t be suitable for environments where staff move around or where the warehouse floor is crowded. However, the emergence of responsive AIVs, which can safely operate alongside human members of staff, could be the key to the widespread deployment of these vehicles. It’s no secret that many businesses are looking to AI and robotics to help provide solutions that address the ‘skills shortage’ within the manufacturing sector. Vehicle manufacturers for example, have been successfully implementing the use of AI in their development processes for many years. It’s time for food manufacturers to catch up and begin to implement intelligent solutions such as this cabbage conveying system! Furthermore, customers are now ‘less loyal’ than ever before and are not afraid to make the move to another brand following a poor customer experience such as a faulty or poor tasting product. Automated solutions, when programmed correctly, reduce the incidence of human error and produce more consistent product lines – this could be in the form of packaging or the good itself. 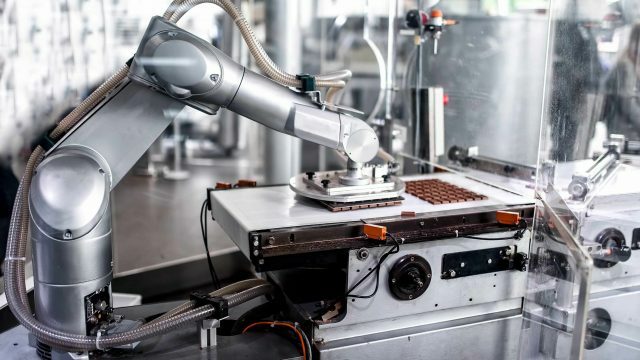 Any technology that can be used to minimise health and safety risks can only be a good thing, and for those involved in the food manufacturing process, the benefits of the correct use of robotics and AI could be enormous. Using cobots that can reduce the risk of human members of staff coming into contact with dangerous conditions should be done when possible. I predict it will become more commonplace in warehouses this year where robots will deal with the dangerous part of the work specifically, safeguarding physical members of staff. Automation is a welcome alternative to having to manually complete repetitive tasks by hand, leaving the human operator time and space to think about other elements of work that require higher levels of skill. They will also play a crucial role in tasks where humans are restricted through problems such as space restraints or hazardous conditions such as extreme high or low temperatures. Technology is constantly changing and these new solutions require vast amounts of time, collaboration, thought and testing to ensure they perform to the best of their ability. While companies are working tirelessly to ensure these elements will be implemented seamlessly, the goal posts for what successful automation means is constantly shifting, therefore continuous research is critical. Furthemore, it’s important to remember that while AI and robotics are excellent ways to improve productivity and reduce costs for food manufacturers, these solutions have been designed to support human members of staff, rather than replacing them.